It's okay if you did a double take when you saw this basket. We completely understand - it's beautiful - and filled with twice the amount of gifts as usual, exclusively from GourmetGiftBaskets.com! 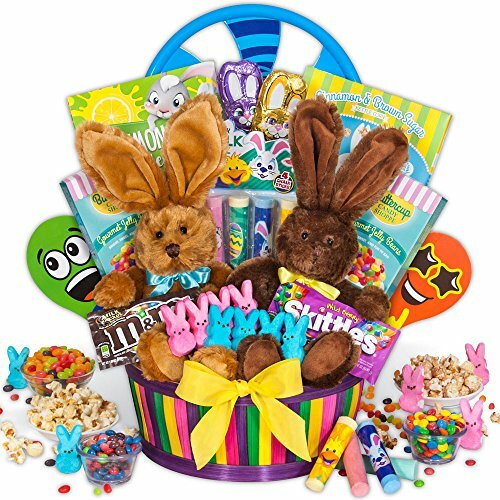 Inside are two adorable, handcrafted bunnies, a selection of the sweetest ever candies, and fun toys, creating an impressive, jaw-dropping Easter arrangement that's the perfect choice for one recipient or two! New 2018 Easter design! It's okay if you did a double take when you saw this exclusive GourmetGiftBaskets.com Easter basket. We completely understand. It's beautiful, filled with twice the amount of gifts as usual, and is a perfect choice for one recipient or two! Inside are two adorable, handcrafted plush bunnies with bow ties! Accompanying them are classic Easter candies and toys: two solid milk chocolate bunnies, two marshmallow Peeps, two boxes of jelly beans by Buttercup Candy Shoppe, M&Ms, Cinnamon and Brown Sugar Popcorn by KingofPOP, Skittles, Lemonade Kettle Corn by KingofPOP, Easter sidewalk chalk, a frisbee, and 2 Emoji Paddle Ball Games! Keepsake basket with Easter treats is professionally shrink wrapped with festive ribbon.